I've been having a rough few weeks but managed to finish this card with the most adorable image "Santa in the Window" from The Stamping Boutique. I kept the card fairly simple because I wanted to focus on the image. The "Believe" sentiment was taken from a rubber stamp that I own and added on top of the image. I then added some Glossy Accents to make it really pop! The image was coloured with copics and then mounted on Bazill Cardstock some of which was embossed with my snowflake cuttlebug folder and then spritzed with Pearl Glimmer Mist. It's really hard to tell from the photo. This image reminds me so much of being a little girl waiting for Santa to arrive! I tell my son all the time that if he doesn't believe Santa won't come but being 10 now he tells me "Mom, you know I don't believe anymore & Santa still comes!" 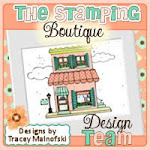 Did you hear that The Stamping Boutique has added some new designers? Check out the post here for the amazing new additions to the team and don't forget to enter any of your TSB creations into the monthly contest ending next week! Paperworks Co Ultimate Summer Challenge - Please Vote! We would love it if you could check out our submissions on the Paperworks Co Blog and Vote for us! You can vote for our team "Sundae Sweeties" do so by clicking here! To see my Paper Sundaes post for today please scroll down! Happy Sundae! This week's Paper Sundaes Challenge #32 is a sketch challenge! I'm super excited about it because not only did I create the sketch for this week but we are being sponsored once again by Paper Jewels! Jenny's store carries a wide range of stamps from Bildmalarna, Sweet Pea Stamps, CC Designs and the most recent addition Spesch Stamps. She also carries embellishments such as rhinestones & pearls so be sure to stop by & check it out! For my card I chose to use a stamp that I just got last week from Paper Jewels "Cupcake Kiki La Rue". Isn't she the sweetest? I coloured the images with copics & all design paper was by Bo Bunny! Besides Basic Grey I think this is another one of my favourite paper manufacturers! I used one of my cuttlebug folders on coredinations cardstock and then lightly sanded to let some of the lighter shade blue show through. I added some buttons & the sentiment is actually from the Whiff of Joy Summer 2009 Kit. 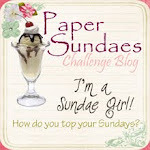 I hope you'll play along with us at Paper Sundaes this week I always love checking out everyones creations! I love everything about this card! I made it for a sample card for The Stamping Boutiques First Birthday Celebration over at The Latte Lounge but I unfortunately was away for my nephews birthday and couldn't attend. Things have been so hectic lately that I didn't get time to post until now. 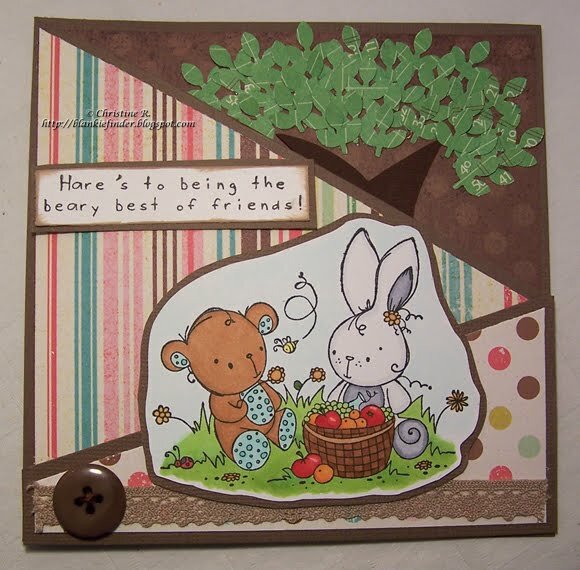 The image coloured by copics from The Stamping Boutique is "Birthday Bunny". Isn't it super cute! The fabulous design paper is all by Imaginisce and the cardstock is Bazill. I embossed the blue background panel with my Happy Birthday Cuttlebug embossing folder. I think it was the first time I've used it & I love the look of it! Don't forget you still have time to enter TSB's Monthly Contest! All you need to do is add a link to your creations showcasing The Stamping Boutique images & you have a chance to win 5 free images of your choice! Tracey has some amazing new images in the store so be sure to enter for your chance to win! 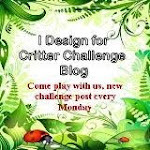 I'm entering this into the current challenge at Stamp Something Challenge Blog (to use a digi image)! 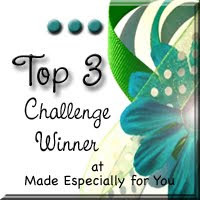 Paperworks Co Ultimate Summer Challenge #1 - Sketch Specially for you! I'm super excited to be participating in Paperworks Co's Ultimage Summer Challenge with a great group of girls: Christine, Shana & Danielle (we are know as the Sundae Sweeties)! When Christine asked if I would be on their team I was super excited as I've never participated in a Team Challenge before! Basically everyone has a team of 4 & only one member gets to create a card for a particular challenge. In my case I got the first challenge which was a sketch challenge (PWCO SS#46) and my creation had to be any shape except for square or rectangle. Since I don't own any animal images from Paperworks Co we were allowed to use a free digi provided or any animal digi from a company called Chi Chi Memories. I chose to use an image from the set "Specially for You"
I cut out this card on my Cricut Expression on Bazill Cardstock and then cut the liner for the card out of design paper from Little Yellow Bicycle (scraps from my last post). The image was coloured with copics and I used my circle nesties to cut it out and used the scallop circles for the background of the image. I addeded some pink rhinestone bling, pink lace ribbon, butterflies (using MS punch), some pearls & the sentiment. I used my pink spica glitter pen for the edges of the card as well. I can't wait to see what everyone else comes up with & we have until August 21st to complete & submit our projects & then the public (this means you) gets to vote! Wish us luck! 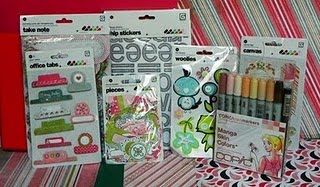 There are some great prizes to be won including some Paperworks Co stamps which I would LOVE to add to my collection! Happy Sundae! Today marks Paper Sundae's 31st Challenge and this week it's a recipe challenge. Danielle picked the recipe & here it is: 2 DP (design paper), 3 buttons & 4 flowers! Your card or creation must include these items! We hope you'll play along with us as we love checking out everyone's creations! Our sponsor this week is Meljen's Design's and you can find these fabulous digi images over at Whimsy Stamps. I've been lucky enough to win some Meljen's images from a couple of challenges I was in and they are super cute. 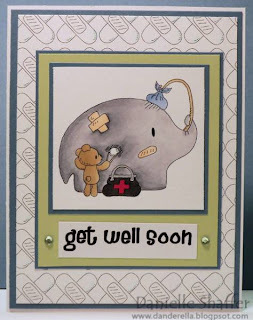 I used the digi image "Little Girl Bear Hugs" for my card because she is simply adorable! I coloured the image quite a while ago while I was away at our cabin and found this cute design paper from Little Yellow Bicycle to match. I inked the edges of the image with Tim Holtz Distress Ink in Spun Sugar and then added Cotton Candy coloured stickles to them as well. The flowers are Mulberry Street by Petaloo and the buttons I've had for a while now. Hope you are enjoying your weekend! I just got back from a fabulous day at Cultus Lake celebrating my nephew's 13th birthday & I'm so tired so I'm heading off to bed. 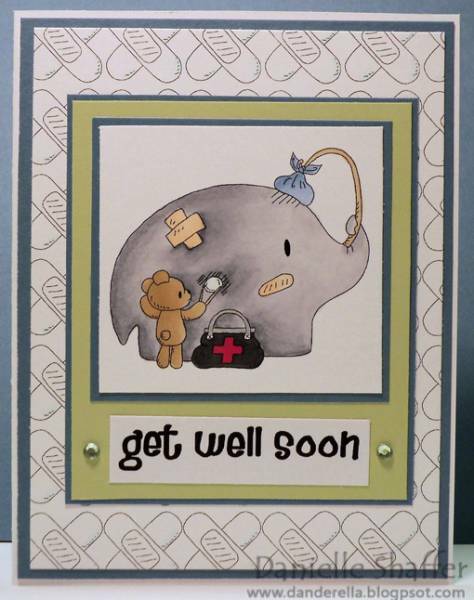 I used The Stamping Boutique Image "MAX" for this card! Isn't he so cool? My son loves this image too and had fun colouring it so once he finishes a card I'll be sure to post some photos. 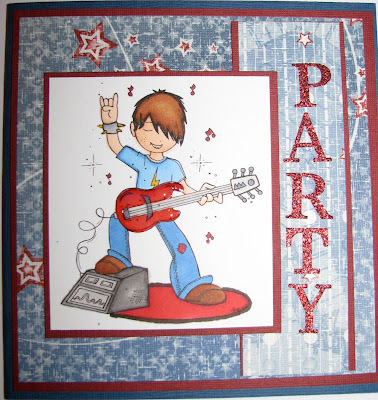 The design paper I used is by Daisy Bucket Designs and is called "Rockstar" which fits this image perfectly. I coloured the image with copics and kept the layout simple. The red glittery letters are by Making Memories and I've had them for quite a while so it was nice to pull them out and use them. I even added glossy accents to the guitar to make it shine! Tracey has a bunch of really cool images perfect for the teenage crowd so be sure to check out the store to see them. Don't forget tomorrow we are having a Digi Day Party over at The Latte Lounge to celebrate "The Stamping Boutiques" first birthday. See my post below for more details! If you come by & visit there is an awesome new Princess Jennifer Latte image which Tracey is giving away for free! Digi Day for TSB First Birthday! The Stamping Boutique is celebrating it's first birthday and to celebrate we are having a Digi Day celebration over at TLL (The Latte Lounge)! There will be fun challenges, chatting & prizes this Saturday, August 14th at The Latte Lounge from 7-9 Central. I'm hoping I can make it back in time to join in but it's my nephew's birthday & we will be away. Hopefully we will see you there! Happy Sundae! 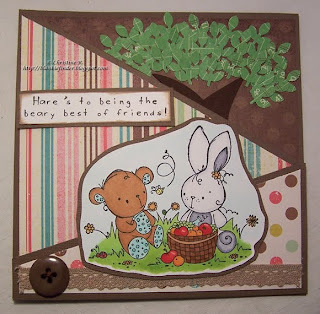 It's Paper Sundaes Challenge #30 wow how time flies when you are having fun! This week our challenge is to use Metal on your card/project and our sponsor for the week is Stamp & Create! 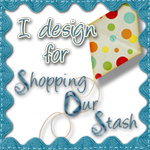 This is another great store to shop at with a variety of stamps, embellishments, nestabilities and so much more! I bought my bow-easy and some fabulous silk ribbon there and they have really fast service. One lucky winner this week will win a $20 gift certificate to spend at Lacey's store! For my card/project I used a stamp available at Stamp & Create "Chillin' Out" which is from the Wags N Whiskers line. I coloured the image with copics and then drew the sun and sand around the image with my copic multiliner pen. I used glossy accents on the sunglasses and used one of my cuttlebug folders for the swirl background. I used red adhesive metal letters that I've had for quite a while for "Summer Fun". I think that I may actually use this on a scrapbook page in the future for those lazy summer days at the beach! Hope everyone is enjoying their summer! I ABSOLUTELY LOVE SNOWMEN! 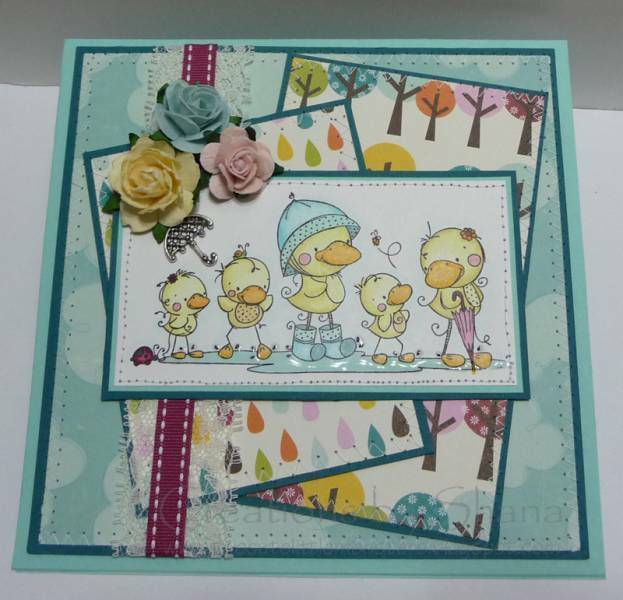 As soon as I saw this image "Snowfriends" from The Stamping Boutique I fell instantly in love. Aren't they super cute? I paired this copic coloured image with papers from the "Eskimo Kisses" line by Basic Grey which I recently got from "Simon Says Stamp". This line of paper is so much fun and I love the colours! I followed the current sketch from The Sweet Stop (Sketch 67-SSS67) just rotated it a bit. They have really great sketches which I always seem to be drawn to and hope to play along with more often! I also used some felt snowflakes from Stampin Up which I've had for quite awhile & used my copic airbrush system to colour them to match. Other supplies used: SU scallop border punch & brads. I will also be entering my card into Stamp Something's Christmas in July Challenge. 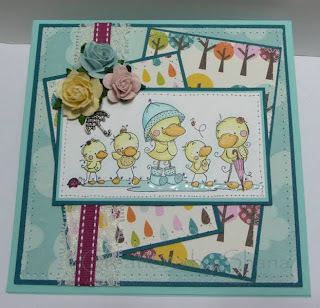 Now that we are in a new month be sure to enter your creations using The Stamping Boutique images into our current monthly contest to win free images or a chance to be a guest designer! Tracey just created a whole bunch of new school related digi images that you should definitely check out! They are great for cards & scrapbook pages! Happy Sundae! The theme/technique for this weeks Paper Sundaes Challenge #29 is STITCHING! This week our wonderful sponsor is Belles & Whistles so I used the image "Li'l Miss Poppy" for my card.